More than 240 Palestinians have been killed in air strikes, nearly 77 percent of them civilians, including almost fifty children. Gaza City—Gaza is filled with the sounds of war. Normally a bustling and noisy place, the cacophony of its dense urban life has been replaced with the incessant buzzing of drones, the booms of naval artillery, the screech of F-16s and the blasts of missiles, shells and bombs crashing down. There are no sirens in Gaza, no shelters, no air defense system. There is only destruction and death. More than 240 Palestinians have been killed in ten days of bombardment by the Israeli military. Around 77 percent of the dead are civilians, including nearly fifty children, according to the United Nations. The devastation is visible around every corner. Disfigured buildings, facades ripped open, buckle over in grotesque poses, spilling their insides onto the streets: a fridge covered in cement dust, a torn mattress, a closet ripped in half. Shards of glass festoon the roads. More than 1,600 homes have been reduced to rubble or severely damaged. Dozens of graveyards have been hit. 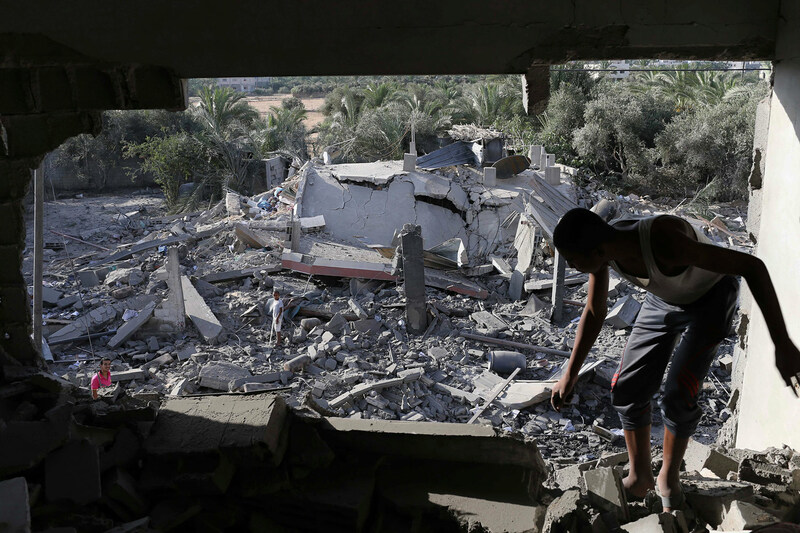 “The Israelis are even trying to kill the dead,” one resident says. Four young boys from the same family were killed as they played on a jetty in the sea when an Israeli naval shell landed on them. One died instantly, the others ran up the beach. “We ran towards the cafe with the foreigners,” says Hamada al-Bakr, one of the survivors, referring to the Deira hotel where foreign correspondents witnessed the attack. Hamada speaks lying in a hospital bed, wincing in pain from a shell fragment that lodged his chest. They never made it to the Deira. The second shell hit the other boys while they were running, forty yards away from the initial strike. Ali Abu Hassera, a fisherman who was standing nearby, says the gunner must have adjusted his aim to target them. Three more were killed. They were thrown tens of yards apart by the force of the blast. When Abu Haseera and his colleagues ran towards the boys to help, another shell hit, wounding two of them. Mohamed, 11 years old; Zakaria, 10; Ismail, 11; and Ahed 10. All from the al-Bakr family, all cousins. All dead. Mohamed’s family—his seven sisters, his mother and aunts—sit in their cramped living room the next day weeping. His mother sways back and forth in shock. “Mohamed loved the sea, his whole world was in the water” says his aunt, Mona al-Bakr. They are a family of fishermen. “All we have is the sea and now we die there,” she says. Mohamed’s father, Ramez, is bed-ridden with a back injury from years of grueling work hauling nets. Mohamed, who would sell tea to other fisherman for extra money, was to be the family breadwinner. “His dream was to open a shop selling fish,” Mona says. The terror for the al-Bakr family continued the morning after the killings when the Israeli military “knocked on the roof” of their neighbor’s house at 4 am—firing a warning shot to encourage residents to evacuate prior to a strike. They scrambled out of their house, the children screaming and falling over each other. Three minutes later, two missiles smashed into an open lot nearby. Such tragedy is everywhere in Gaza. The main al-Shifa hospital in Gaza City is filled with the wounded and their stories. More than 1,800 have been injured in the Israeli assault so far. In the intensive care unit lies Osama al-Batsh. Tubes are attached to his body, and he is sedated. His right leg has been amputated, a stump that protrudes awkwardly out his cot. There are burns over 20 percent of his body. His skull and jaw are fractured. He was wounded in a twin F-16 missile strike on his family home on June 13, an attack that killed eighteen of his relatives in one of the deadliest days in Israel’s military campaign. The Israelis were reportedly targeting Gaza’s police chief, Tayseer al-Batsh, who is also in critical condition. At the site of the strike, the only remains of the al-Batsh home are the concrete foundations that jut out of the ground. The rest is rubble. The eighteen dead al-Batsh family members are buried just yards away. Cinder blocks have been placed in the dusty ground at the head and foot of the graves to mark them. There are the dead and the wounded. And then there are the more than 22,000 displaced. Many of them have taken shelter at schools run by the United Nations. Thousands fled from Beit Lahia in the northern Gaza Strip near the border with Israel after the Israeli military dropped leaflets warning residents to leave. Israel has warned Palestinians in the north, south and east of Gaza to evacuate their homes. The sea lies to the west. The school is at full capacity with 1,600 people, according to a UN staffer, but the displaced continue to stream in. Some of them left their homes in a panic, barefoot. Many say they don’t get enough food or water at the school, that they are stuffed together in small rooms in the sweltering summer heat. “They don’t care about us here,” says Ghalia al-Swarka, who also fled her home in Beit Lahia. Her 5-year-old son, Ahmed, is traumatized from the constant bombardment. He shakes uncontrollably during airstrikes. “They are terrorizing us psychologically,” she says. Nearly all Palestinians say they support the “resistance” when asked about the firing of hundreds of rockets into Israel that has killed one Israeli. They say they are under occupation, under siege. On Thursday, life breathed back into Gaza during a brief five-hour cease-fire by Israel—between 10 am and 3 pm. Empty streets fill with people and clog with traffic. Huge crowds gather at banks and ATMs to try and withdraw cash. Markets are bustling with customers buying food and supplies. The cease-fire turns out to be a brief respite. A lull before the storm. At sunset, the Israeli military begins to pound Gaza from the air, land and sea. Flares illuminate the northern and eastern parts of the Strip. The bombardment is continuous, the most intense of the ten-day assault. The Wafaa hospital in the east—that houses disabled patients—comes under heavy attack and is partially evacuated. Then the news breaks. Israel has launched a ground invasion. They are coming in. The first time since the brutal 2008–09 assault that left over 1,300 dead. The power goes out and Gaza is plunged into darkness as 1.8 million Palestinians brace for more violence.